I found an ad for a company called Personal Creations and looked them up online. 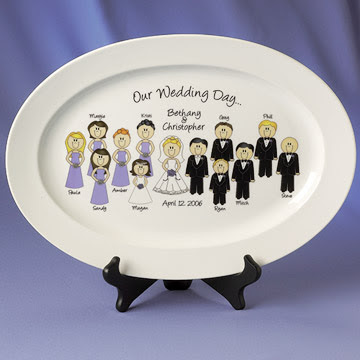 I came across a darling ceramic caricature platter with your full wedding party cast designed on it. We have all seen this idea displayed with family member faces put on stickers on backs of family mini vans but now you can incorporate it into your wedding day. They have a huge variety of faces and features to choose from to design your platter. After choosing your wedding party the company will produce your plate and mail it to you to put on display. For the couple, that is looking for something, different, memorable and fun, this is a very cute idea. If this idea itests you at all, email me and I can give you a promo code to use at check out for a 25% discount.